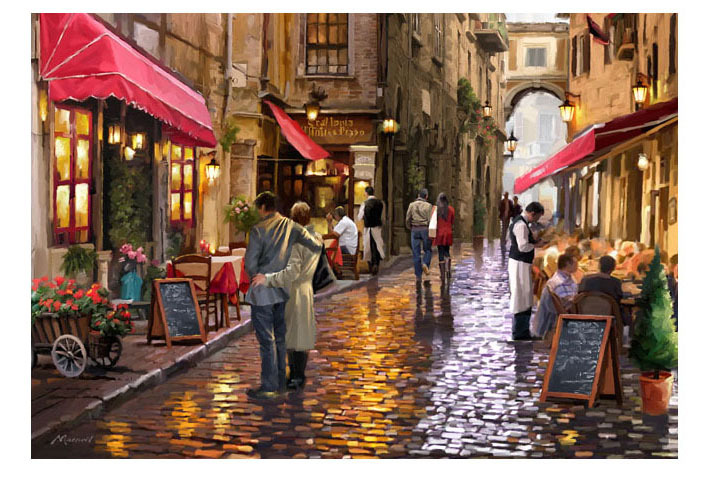 This particular print, Cafe stroll, will compliment any interior beautifully with its street design displayed in superb detail. Richard has created this design in a range of warm tones which has achieved much emotion within the piece. Richards interpretation for Cafe Stroll was to achievie an authentic moment within an urban setting, enhanced with a feel of romance. To offer our customers a greater understanding of how a Richard Macneil stretch box canvas will appear we have produced this description of a design constructed in this style. A stretch Box canvas sees Richards design printed onto a canvas material and then stretched onto a wooden frame exactly how an artist's canvas is made. Typically our canvases are produced using Innova IFA33 360gsm 100% cotton which is a matt fine art canvas material. The Canvas is varnished after printing using a giclee ph.neutral varnish to enhance the print as well as protect the surface and aid cleaning. The Canvas is hand stretched onto a wooden stretcher to complete the process. Below is a photograph of a Richard Macneil Stretch Box Canvas- to give an idea how a Richard Macneil Stretch box Canvas will arrive. Here at The Macneil Studio we feel Stretch Box Canvases give a modern, contemporary feel to displaying artwork. The Stretch Box Canvas format allows the artwork to be showcased perfectly- with no frame or mount to distract from the beauty of the design. We have found stretch box canvases work exceptionally well with Richards work and he personally feels "Stretch Box Canvases allow the art to be hung exactly as he sees it when painting the canvas- art at its purest form"